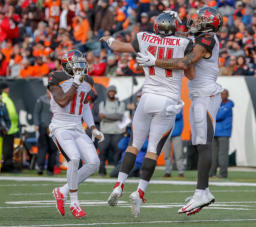 It was almost another dose of Fitzmagic as Ryan Fitzpatrick came off the bench in the fourth quarter and brought the Bucs back from 18 points down only to see the Bengals win it on a 44-yard fieldgoal as time expired. Jameis Winston was benched after throwing four interceptions bringing the veteran Fitzpatrick behind center once more. 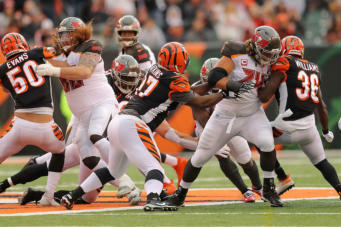 The Bucs racked up 576 yards in total offense to continue to lead the NFL in that category. INDIVIDUAL STATISTICS RUSHING BUCS: Barber 19-85, Winston 3-18, Fitzpatrick 1-18, Rodgers 1-4, Jackson 1-4, Jones 2-(-3). 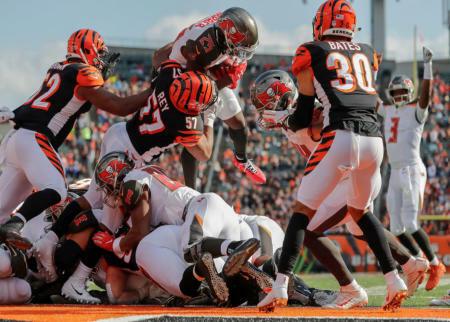 BENGALS: Mixon 21-123, Dalton 3-10, Walton 2-7, Boyd 1-(-2). PASSING BUCS: Winston 35-18-276-4-1, Fitzpatrick 15-11-194-0-2. BENGALS: Dalton 34-21-280-0-2. RECEIVING BUCS: Humphries 7-76, Evans 6-179, Howard 4-68, Rodgers 4-25, Jackson 3-68, Godwin 2-32, Brate 1-13, Watson 1-5, Jones 1-4. BENGALS: Boyd 9-138, Green 5-76, Mixon 3-15, Franks 1-32, Walton 1-10, Erickson 1-5, Lengel 1-4. INTERCEPTIONS BUCS: none. BENGALS: Williams 1-29, Bates 1-21, Brown 1-18, Evans 1-7. KICK RETURNS BUCS: none. BENGALS: Erickson 2-31. PUNT RETURNS BUCS: Humphries 1-8. BENGALS: Erickson 2-29. SACKS BUCS: Pierre-Paul 2-16. BENGALS: Dunlap 2-6, Evans 1.5-0, Washington 1-8, Hubbard 1-6, Johnson 0.5-0.